Welcome to another episode of #ThatBusinessShow, where our favorite day of the week is Wednesday; because it’s #WorkingWomenWednesday! 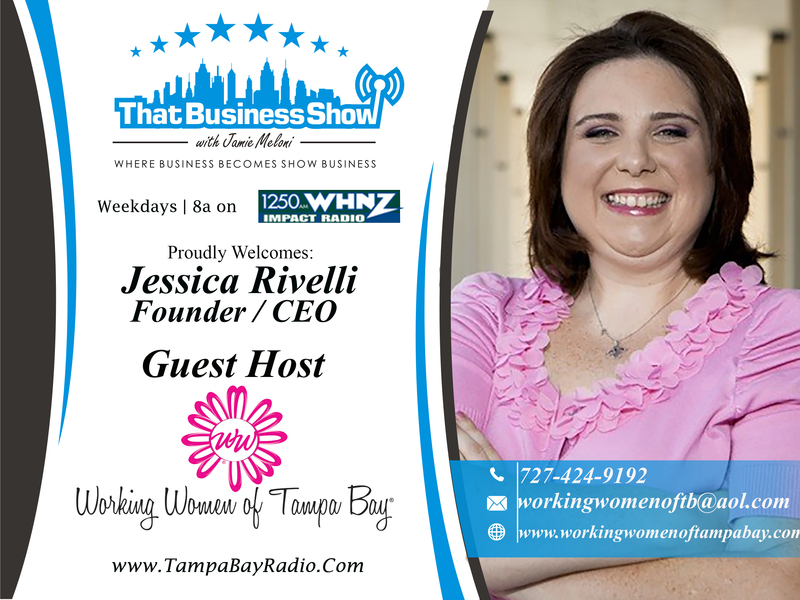 Today was a special episode, since Jamie was on his Tibetan mountain trek- as per Topher Morrison – therefore we had Jessica Rivelli, Founder and CEO of The Working Women of Tampa Bay Group. 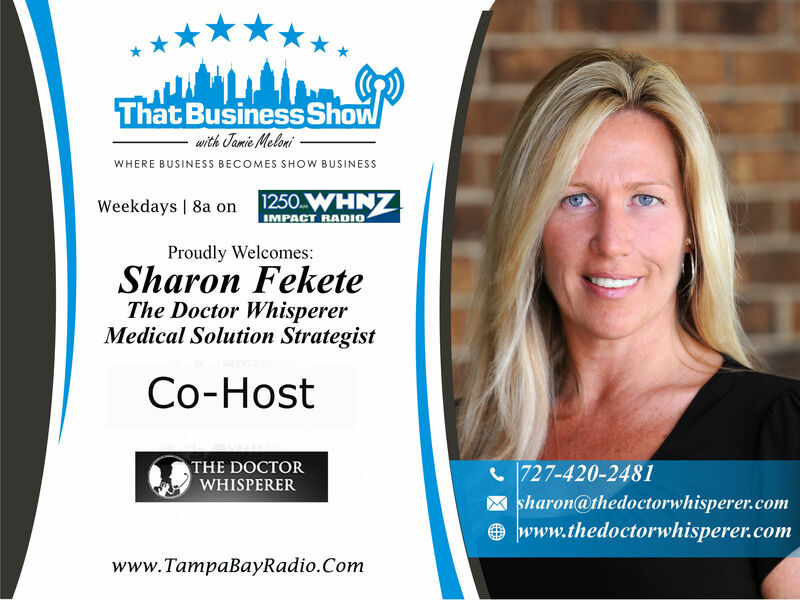 Co Hosting on today’s show was Sharon Fekete, The doctor whisper! We had a great lineup from The Working Women of Tampa Bay, joining us in the studio with our guest host was Katie McGill, Executive Director of Dress For Success Tampa Bay. We also welcomed Jennifer McVan, The Director of Media Relations for Florida Hospital West Florida Region. After exchanging a few hello’s, Jessica and Sharon shared with us the highlights of The Working Women of Tampa Bay Convention, which took place last week. We had a great discussion on #ThatBusinessShow, and remember if you missed today’s episode you can head to www.tampabayradio.com to listen to any show on demand, and view our livestream on www.youtube.com/jamiemeloni. 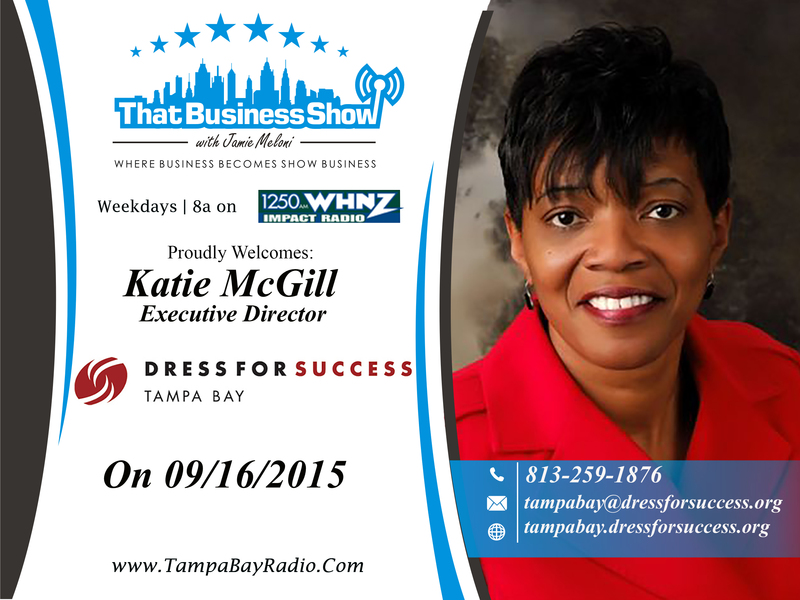 Our first guest on #ThatBusinessShow with Guest Host Jessica Rivelli was Katie McGill, Executive Director of Dress For Success Tampa Bay. Katie has dedicated much of her adult life to helping people better themselves through classroom workshops, retreats, and workforce development programs. Katie is well known throughout Tampa Bay because of her volunteerism and work with Dress For Success Tampa Bay. Through Dress For Success Tampa Bay, Katie has donated over 13,000 business suits to women who are disadvantaged, or who are suffering from abuse, violence, and harsh times. Katie discussed with us how Dress For Success Tampa Bay gives women hope by teaching them the skills needed to succeed in the business world, and to better themselves through educational programs and retreats. We are proud to spread The word of Dress For Success Tampa Bay, and Katie McGill because of the work that they do for the community. #HelpingOurCity. Dress For Success Tampa Bay has an inventory sale to help women on Sep 26th at the Bayshore Baptist Church. They also have a fashion show on Oct 22nd. Learn more about these events and about Dress For Success Tampa Bay, and about Katie McGill at www.tampabay.dressforsuccess.org. 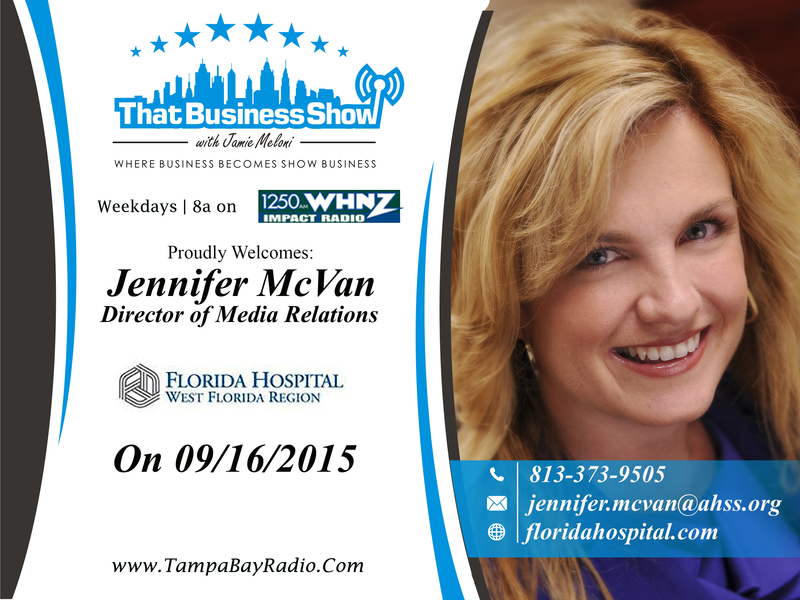 Our last guest on #ThatBusinessShow was Jennifer McVan, Director of Media Relations for Florida Hospital West Florida region, a 1257 bed healthcare system! On the show, Jennifer and Jessica discussed how she manages the day-to-day media relations and crisis communications for nine hospitals as well as planned events, campaigns and press conferences. She spoke to us a little about her and me award-winning journalism career in Orlando with NBC news channel 2. Jennifer and Florida Hospital West Florida Region have a lot of events coming up, one beginning tomorrow! The child’s healthcare seminar is tomorrow at Tampa Palms Golf and Country Club. There’s limited seating the and registration is at: FHTampa.org/Passport. There are also some other events, and you can find out all about these events at www.floridahospital.com. Jennifer also wishes to remind our guests that October is breast cancer awareness month, and that women need to be checked for breast cancer and other health ailments every year! We had a great time welcoming Jennifer McVan, Director of Media Relations with Florida hospital West Florida Region on #ThatBusinessShow. If you missed Jennifer on the show, head over to www.tampabayradio.com to listen to the show on demand! This entry was posted in Articles, Entrepreneurship and Business and tagged radio, talk, work, working women of tampa bay. Bookmark the permalink.